I have had the luxury of wearing a number of different “hats” throughout the course of my hockey journey. I am and have been a son, a brother, a student-athlete, a mentor, and a coach. Soon I will be a father myself. Just like any other soon-to-be-father, I have already planned out my future baby boy’s entire life. He will be a 4.0 student through grade school and high school and play hockey at Harvard. Following college, he will be drafted No. 1 overall and then go on to play 15 years in the NHL for the Detroit Red Wings, make millions of dollars and get his jersey retired at Joe Louis Arena. Then he will take a head job in the front office for the team the following season. Everyone will know his name! 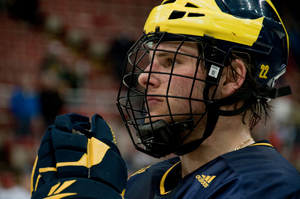 Brandon Naurato is the Director of Hockey for Total Package Hockey Detroit. For more information on TPH, click the logo above. Is it their dream or is it yours? As parents, you have the opportunity to use hockey as a metaphor for life. Every single day we can take an example of success or failure to help shape the minds of our youth to teach valuable life lessons. First thing’s first – throughout this article, I am assuming that hockey is your son/daughter’s passion. If it it’s not, then read this article again and take out the word hockey and replace it with whatever they are passionate about right now…sports, academics, hobbies, whatever. “Play with passion and heart. It was never about what line I was on, how much ice time I had, or why a certain player was playing over me. Bottom line – he never brought up the drama or gossiped about situations that were out of my control. It was all about sticking to the process in order to earn the desired result that I wanted for myself at the end of the day. I have had the pleasure of developing friendships with a number of parents over the last few years through hockey. There is one common denominator between all of these people and it is that they coach their kids in life, NOT HOCKEY. These are the same parents that pick up the phone to call the experts to educate them on the path going forward. They are asking the right questions so that they can do their job and their job is to do one thing and one thing only…BE SUPPORTIVE. So the next time you’re in the car driving home from the rink please be supportive. Support the coach, support his teammates and support your child. We are all imperfect people and we all make mistakes. Instead of criticizing your situation or what others around you are doing, let’s stick to the positives and find ways for your child to be better. A better teammate, a better worker, and a better attitude are a few ways to start the process. Ask your son/daughter the same questions that my father asked me because if they are passionate, if they compete, and if they love the game, then there is no doubt in my mind that they will find the reward that they are looking for. I don’t know exactly how this role of “parent” will play out for me, given that my life’s work is dedicated to a specific sport that I love so much. I don’t know if my son will make it to an elite level of hockey, I don’t even know if he will love hockey the way that I do or even play the game, and that’s okay. What I do know is that I plan to support him every single day in WHATEVER he chooses to be passionate about, and I plan to be the best “life” coach I possibly can be for him.